Review by AllTheBestFights.com: 2015-11-21, Kaew Fairtex vs Kimura Minoru 2 gets three stars thanks to a good finish. The former Lumpinee, Wbc and Wpmf muay thai champion Kaew Fairtex entered this fight with a professional kickboxing record of 133-31-4 (41 knockouts) and he is ranked as the No.1 super lightweight in the world while his opponent, Minoru ‘Philip’ Kimura, has an official record of 20-4-1 (15 KOs=75%) and he entered as the No.2 in the same weight class. In their first bout Kaew lost to Kimura by majority decision (January 18, 2015), after this fight the Thai has won three consecutive bouts. 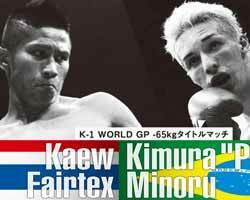 Kaew vs Kimura 2, main event of “K-1 WGP 2015 The Championship”, is valid for the K-1 World GP -65kg title (Kaew’s first defense). Watch the video and rate this fight!